Possibly the Cheapest Earcandle prices in the UK. We will do our best to price match any similar offer. 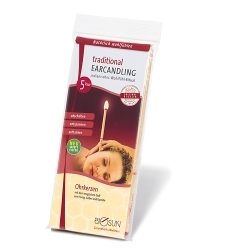 We are currently out of stock of the Biosun brand of ear candles. However we have several other brands of quality value for money candles here. Alternatively please see our full range of ear candles here. Most of the candles above are in stock normally posted within 1 - 5 working days. Sort Life Out Ltd (established 2004). Earcandles are derived from a shamanistic tradition. Their historic roots can be traced back to the Indians of North & South America. This tradition was brought to modern Europe by the Hopi, the oldest Pueblo tribe which has vast medical knowledge and deep spirituality. Hopi Earcandles are still made today with natural ingredients following a secret original recipe. The earcandle is traditionally used to cleanse and harmonise different energy fields of the individual (Aura), to prepare the mediumistic state of trance and also expel negative energy. Whilst the candle burns, the pleasant heat sensation increases. Locally administered heat always stimulates peripheral blood circulation, thus intensifying the immunological defence system and lymph cleansing circulation. It also stimulates energy points and reflex zones. The earcandles work by causing a light suction action (chimney effect) and the movement of the flame helps to create a vibration of air in the earcandle, generating a massage-like effect on the eardrum. This induces a pleasant feeling of warmth and a balance of pressure in the ears, forehead and sinuses. It is soothing and the benefits have been well known for many years. In addition, high energy light from the flame penetrates through the candle tunnel bringing vital spectral frequency to important energy centres. From an esoteric point of view, the cleansing fire expels negative tenuous energy field vibrations and harmonises the energy status. The whole ceremony brings a wonderful relaxation, a deep sense of security and a feeling of happiness. Hopi Earcandles use only pure beeswax, honey extract and traditional herbs such as Sage, St. John's Wort, Camomile and pure essential oils. Only premium quality, pesticide-free untreated cotton is used. Hopi Earcandles are regularly tested by independent institutes and are certified medical products according to EC guidelines 93/42 (EEC). Original BioSun Hopi Earcandles have been used with great success and satisfaction by men and women all over the world for over fifteen years. What are Biosun EarCandles used for? EarCandles are excellent in the treatment of nose and throat congestion, sinusitis, headaches, T.M.J. pain, tinnitus and otitis externa/tropical ear. Ideal relaxation treatment for stress or anxiety related symptoms. Softens earwax for easy removal. Remember, if in doubt, contact your GP. Any condition of the ear for which you are currently receiving medical treatment, without consulting your prescribing doctor. However, most clients find the treatment relaxing and regularly describe a "slight relieved feeling" in the ears and head but also a relaxing and calming effect on the whole system. You are asked to lie comfortably and listen to relaxing music. The candle is then gently placed into the auditory canal, where it is lit. The candle is held it in a vertical position, keeping it steady and preventing any ash falling on to you. You will experience a pleasant crackling sound as the candle burns and a warm comfortable feeling. As the candle burns down, the residue ash (if it falls) will just turn to dust. The candle is then taken away while you lie there for a few moments before turning over to treat the other ear. Most clients find the whole experience very relaxing. Some fall asleep during treatment. It is advised to have a second person to make sure that the ear candle is vertical during the session and to extinguish the candle safely at the end. An alternative would be to sit on a chair with the candle held horizontally, however this may not be as relaxing. Here are some typical questions. Hopefully anything you might want to know is covered somewhere on this page. If it isn't, don't hesitate to contact us. Does it help to have a treatment before taking a flight? Yes - if you have no ear infection and if you suffer with ears or sinus problems, it is a good idea to have a treatment prior to your flight to get rid of any excess wax. I suffer from a lot of ear wax and often have them syringed. Could I use these candles? Yes you could. Many people who previously endured the discomfort of syringing now have a hopi treatment instead. As a safety precaution it is advised to have a second person (ie. partner, family member, friend or therapist) to make sure that the ear candle is snugly inside the ear, held, vertical during the session and to extinguish the candle safely at the end. Also for some brands of ear candles in some cases the candle can be trimmed and ash safely removed during the treatment. Are these Biosun Ear Candles or Tapered Candles? 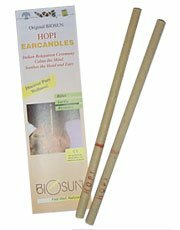 Biosun Hopi Ear candles not tapered. However we supply other types of hopi ear candles that may be tapered or have a tapered ending that fits in the ear. Yes, at least one set of Biosun instructions included in every order. More flyers / leaflets can also be supplied if required. Free 1st class delivery within mainland UK. Discounts available on larger quantities. For urgent orders please add a note in the 'optional instructions' section of your order. We send orders using guaranteeed next day delivery on most orders, but there may be an extra charge for this service. Lots more to be added and updated over the coming weeks and months! Natural Hopi Ear Candles Ancient Therapy of Ear Candling. Made of 100% pure natural beeswax, & pure natural essential oils. Wholesale prices. Recommended. The Otosan Ear Cone is 100% natural and contains propolis which acts as a natural antibiotic, reinforcing the body's defences and fighting viruses and bacteria. Otosan Natural Ear Drops Ancient herbal recipe combines the cleansing and balsamic actions of three essential oils with the soothing and softening properties of sweet almond oil.